Gingerbread men and gingerbread houses enjoy special popularity around the holidays, but many of these gingerbread activities are timeless and complement literature titles that teachers use at the beginning of school or after the holidays. It's very easy to incorporate mathematics into a study of gingerbread men, and students will enjoy the data collection activities and games while learning math skills and deepening their understanding of important mathematical concepts. Look through these math activities and add some to your repertoire. Consider broadening the gingerbread math to include measurement, games and problem solving this year. Use a gingerbread person math mat to model addition sentences. Students may roll a die and place that many counters on one gingerbread person. The student rolls the die again and places that many counters on the other gingerbread person. Next, the student writes a number sentence in the spaces provided. Variation: Insert the gingerbread math mat in a sheet protector and give the student a dry erase marker. Have the student toss a die and make that many tally marks on one of the gingerbread persons. The student tosses the die again and makes that many tally marks on the other gingerbread person. 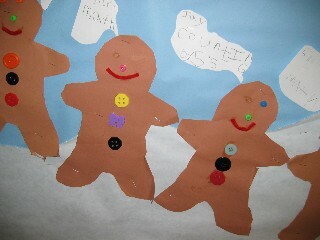 Finally, the student writes a number sentence in the spaces provided below the gingerbread persons. Students will measure using a gingerbread man as a non-standard unit of measurement. Give each student a gingerbread man cutout. Place brightly colored number labels on the objects to be measured so that students can move easily from station to station. Tell students that they will measure today using their gingerbread man. Without moving from seats, ask students to estimate the height or length of objects in the classroom by eyeballing them. They should record their estimates of how many gingerbread men tall or wide each object is on the Gingerbread Man Measurement recording sheet. Next, ask them to circle the object they predict will be the largest. After this, allow students to walk around the room and measure the objects with their gingerbread men. Teacher should move around the room, observing students measuring and lead a discussion at the conclusion of the measurement activity. Please note that blanks have been intentionally left on the recording sheet so that teachers are able to add items from their own classrooms. Bigger or Smaller than a Gingerbread Man? Give each student a gingerbread man cutout and a Measuring with the Gingerbread Man recording sheet, Explain how to use the sheet which has both words and picture cues for non-readers. 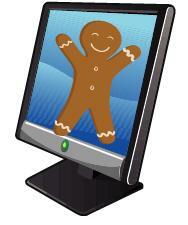 Ask students to walk around the room and measure classroom objects using their gingerbread man. They then draw a picture or write the word in the correct column to show whether it is smaller than, about the same size, or bigger than their gingerbread man. If the classroom has objects labeled with words for literacy purposes, students may easily copy these words onto their worksheets. Make decorating gingerbread cookies an introduction to math probability as well. Create a chart to match the decorations students will use in this center or game activity. Students toss a die and add the appropriate item to their gingerbread man. For example, a die toss of 2 might mean add a button while a die toss of 3 might mean to add rick-rack to decorate their gingerbread cookie mats. Students use the Gingerbread Man Probability recording sheet to keep track of how many dice tosses it takes to complete their gingerbread man cookie decoration. Next, students add their data to the class line plot so that the teacher can lead a discussion about the Gingerbread Man probability of tossing one die. Create gingerbread people decorations that are glyphs so that they represent the answers to different data-collection questions: boy/girl, like/don't like gingerbread, favorite dessert, etc. View another Gingerbread Man Glyph with legend and patterns to print out. 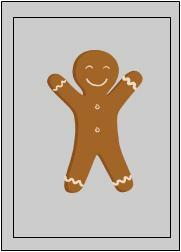 Print out the legend for this Gingerbread Glyph from Mailbox magazine. See student samples of the Gingerbread Glyph from Mailbox magazine. 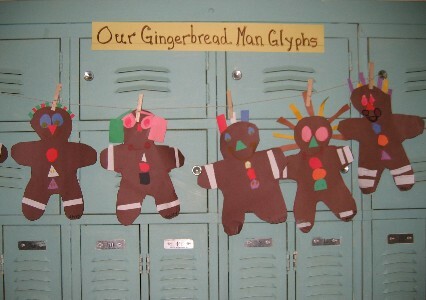 View another set of cute Gingerbread glyphs that included a writing task to analyze a classmate's glyph. This site has an enlarged copy of the glyph legend and pictures of student Gingerbread glyphs. It is very easy to incorporate graphing into a gingerbread man unit. Consider these possibilities to get the creative juices flowing. Remember to include different kinds of graphs as suggested below. There are many different versions of this book that can be used. Read the book as an introductory activity, then set up math activity centers of different gingerbread math activities so that students enjoy a complete Gingerbread Man Math mini-unit. This beautifully illustrated version of the classic gingerbread man story has a twist to the old plot and includes a gingerbread house, making it a perfect version for either gingerbread activity. Include gingerbread math games and activities to complement the theme. Use Jan Brett's Gingerbread Baby Board Game to practice counting skills. For this game, students toss two dice (one regular and one marked A-B-C-D-E-F), form an ordered pair (e.g. B5), then remove the gingerbread man from that space, if there is one. Play continues until the timer rings or until one player has caught 10 gingerbread men. Students love playing the game and they get to practice their coordinate graphing skills in the process. Coordinate Pairs: This seasonal version of the classic Battleship game provides practice in forming coordinate pairs, identifying the x-coordinate (A-F), then the y-coordinate (1-6) so that spaces are identified as C3 or E6. Hopefully, lots of practice will help students transition to the algebraic ordered pairs (x,y) where x and y are both numbers. Just be certain to reinforce the notion that the x-coordinate (across) comes before the y-coordinate (up or down). The alphabetical cues (across comes before up or down) help some students remember the order. Download Catch the Gingerbread Men game mat, game pieces and directions for playing the game. This game was designed to introduce students to the randomness of spinners and dice. Each color gingerbread man starts at the same place and has the same chance of winning by crossing the finish line, but does it work out that way? Students will enjoy playing the game AND use a clothespin graph [see sample on right] to collect some useful data on the winners. Once students have collected class data from playing many games, they will come together to analyze the clothespin graph results. Students will be asked to discuss whether or not they think the game is fair for all of the gingerbread men and explain their reasoning. Download the Run, Gingerbread Men, Run! Game so that students can get started playing and collecting data. 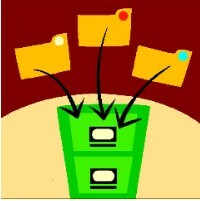 The pdf file contains the spinner, gameboard, clothespin graph icons, and an optional tally sheet. Gingerbread Man Chain requires students to find out how many gingerbread men will be needed to create chains across the bulletin board. Students also need to figure out how many sheets of brown construction paper will be needed for the project. 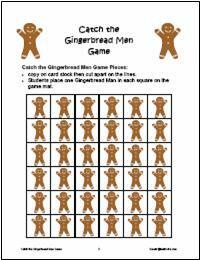 Try the Gingerbread Man Combinations problem challenges students to figure out how many different gingerbread men can be created using an online website Gingerbread Man. Be sure to use calculators for this activity! Try the Gingerbread Man Bake Sale problem, a simpler version of the Gingerbread Man Combinations problem, which challenges students to figure out how many different gingerbread man cookies Ruby can make for the holiday bake sale. Gingerbread Man Adventures: Ask students to write word problems that involve the gingerbread man. Encourage them to think of measurement and patterns as well as numbers as they write their problems, Provide time for students to type in, decorate and print out their problems, then assemble them into a Gingerbread Man math booklet. Use Jan Brett's Gingerbread Baby Board Game to practice counting skills. Pdf file of the gameboard may be printed from the site. 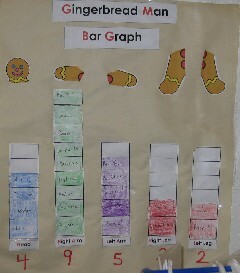 Gingerbread Man Thematic Unit includes graphing and measuring objectives. Check Kindergarten Treehouse's Gingerbread Unit for more suggested math activities. Little Giraffe's Gingerbread Goodies includes suggestions for measuring the area and perimeter of gingerbread men with nonstandard units (marshmallows and Hershey's kisses) plus many other options for including math in a gingerbread man unit. Suggested Gingerbread Math Activities address number sense, measurement and graphing. 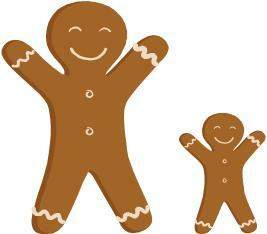 See complete lesson plans and handouts for a Gingerbread Measurement Unit.